Filled with warm spices, walnuts, and a hint of orange, these fiber-filled Whole Wheat Orange Spice Muffins are both healthy and delicious. I won’t bother apologizing for another extended absence. If you’ve been following my adventures at all, you know that I recently located back to the United States after four years in Sicily. If that’s not a reason to take a month off, I don’t know what is! So, first things first. Happy new year to all of you! I spent the holidays with my family in central California and decided not to bother coming back down to San Diego until our furniture arrived from overseas. Aside from hanging out with grandparents, aunts, uncles, and cousins, I did quite a bit of baking while I was there. Lots of muffins (some of which you’ll read about today), a couple pies, and several batches of sourdough bread were baked. Although I did sporadically scribble recipes down and even snapped a few photos here and there, I never managed to pull it all together for a blog post while I was there. And I have to admit that the break has been nice. Well, the furniture finally arrived, along with my car! So I dragged myself back down here to beautiful, sunny San Diego and we’ve been unpacking, arranging and rearranging furniture ever since. Oh, and eating out a lot, too! You know the drill. But thanks to some extra help from my husband over the holiday weekend, I finally have a kitchen I can work with. And as much as I’ve enjoyed eating my way through our neighborhood restaurants, I’m definitely ready to start cooking and baking in my own kitchen again. I’ve made different versions of these muffins several different times over the last month or so. My aunt and uncle have an orange tree in their front yard and I took full advantage of it while I was staying there. Besides the occasional glass of fresh squeezed orange juice for breakfast, we had orange muffins, green salad with orange vinaigrette, orange salad with fresh garlic and crushed red pepper, and even some caramelized brussels sprouts with bacon and an orange glaze. It’s so much fun to create dishes around things that can be picked in your own front yard! As I was leaving Madera to head back down south, the last thing I did was pick a large bag of oranges to take with me and I’ve been enjoying them ever since. 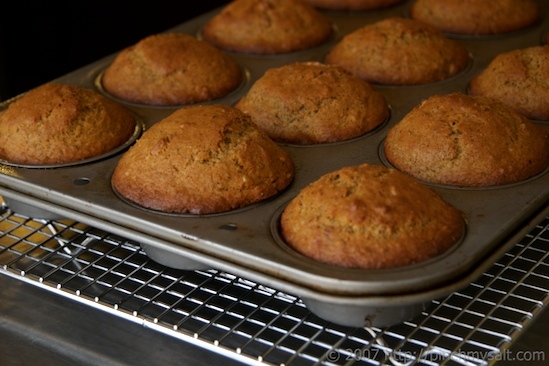 This morning I was down to my last two oranges and decided to bake one more batch of muffins to make sure I had the recipe exactly right before sharing it with you. This was definitely the best batch yet! The thing that’s so great about these muffins is that besides tasting great, they are actually pretty healthy too. They are made with 100% whole wheat flour and have the added nutritional benefit of ground flax seeds and walnuts. Each muffin provides you with 5 grams of fiber and 8 grams of protein so they will keep you feeling satisfied much longer than a traditional store-bought muffin. I think they are perfect for breakfast on the go or as a mid-afternoon snack (sometimes, both). The key to a great batch of muffins is preparation and organization. Once you get started, the process needs to move quickly so it’s best to have your tools and ingredients laid out and ready. But first, you must read carefully through the recipe and make sure that you have all the tools and ingredients required. This is an important rule for any recipe, not just muffins! For this recipe you’ll need these tools: two separate mixing bowls, a few small bowls for holding ingredients, measuring cups, measuring spoons, a wire whisk, a wooden spoon (or any long handled spoon for stirring), a standard 12 cup muffin tin (or two six cup muffin tins), a citrus zester, some type of citrus juicer (or very strong hands for squeezing), and a wire cooling rack. None of these things are too expensive and they are all fairly useful in the kitchen so if you are missing a piece, it might be a good idea to head to the store or even a yard sale or thrift store. Once you’ve located all of your baking tools, you need to read through the recipe and pull out all of your ingredients to make sure you aren’t missing anything. It’s much better to run to the store before you start baking! This recipe calls for flax seed meal and although it’s easy to find at most grocery stores now, it might not be sitting in your pantry yet! I also suggest using King Arthur’s White Whole Wheat flour. It’s really worth seeking out if you plan on doing much whole wheat baking. Once you’ve located all of your ingredients, it’s time to prepare them! Some ingredients might need special treatment or preparation and it’s best to take care of this in the beginning. In this recipe you will first be zesting the oranges and then juicing them. Also, the recipe calls for chopped nuts so if you don’t buy them pre-chopped, you’ll want to chop and measure the nuts at the beginning. Once you’ve done any special preparations, go ahead and measure out your ingredients. For this recipe, all the dry ingredients can be measured into one bowl and the wet ingredients into another. For other recipes you may want to measure ingredients out into separate small bowls. Once your ingredients are measured, read through the recipe again and place your tools and ingredients in order. It took me a really long time to get organized in the kitchen. Actually, I’m still not very organized and I always make a huge mess, but I’m much better than I used to be! It might seem time consuming to measure out everything ahead of time but believe me, it has made me a better baker. Ready for some step-by-step photos? Here I have measured out all of my dry ingredients in one bowl and the wet ingredients in another. You can see that I have my chopped nuts ready to go and my muffin tin and scoop are ready and waiting. The wire whisk is used to ‘sift’ the dry ingredients rather than a sieve because the whole wheat flour and flax seed meal are not fine enough to be sifted in the traditional way. I also use the whisk for the wet ingredients to make sure everything is well incorporated. 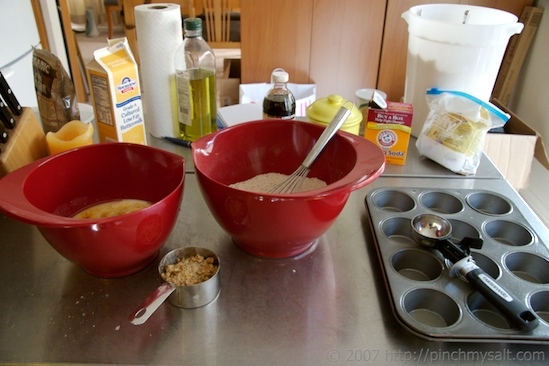 You don’t want to overmix the muffin batter so it is important to mix the wet and dry ingredients separately before combining them for a quick final mix. 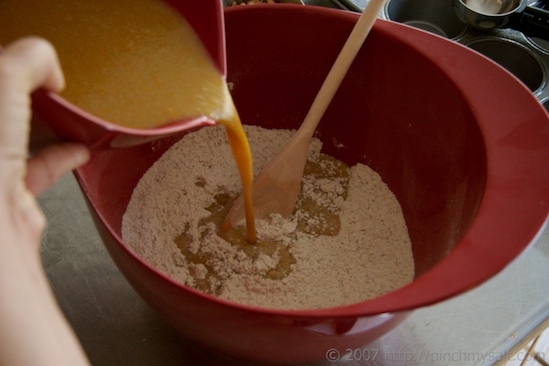 The wet ingredients get poured into the dry ingredients at the end because the leavening agents (baking powder and soda) become activated by the liquid. Once they are combined, you want to move quickly so that the muffins get into the oven before the initial reaction subsides. You will notice the batter getting puffy as you scoop it into the tins. Once they are in the oven, a second reaction occurs with the heat and the muffins continue to rise further (not a very technical explanation but I’m not a scientist!). You want to stir the ingredients together quickly but you don’t want to overmix them or beat the batter too hard. As you can see, this batter is coming together. There are still some bits of flour visible so I will mix it just a bit more until the flour is completely incorporated. This batter has been mixed enough. I am now checking the bottom of the bowl to make sure that there are no flour pockets hiding out down there. It is important to scrape up the flour from the bottom of the bowl as you are mixing because pockets of flour often get stuck down there. 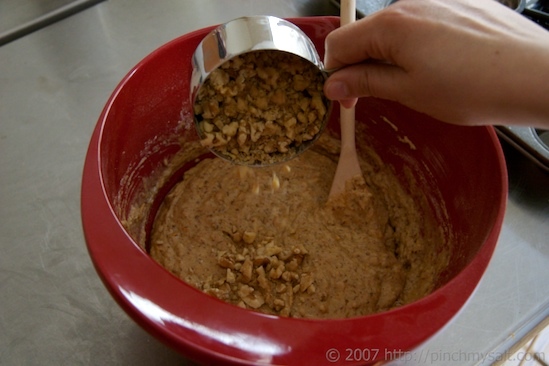 After the batter is thoroughly mixed, the nuts can be added and stirred in. They don’t get added with the flour because the nuts end up holding on to bits of the flour mixture, making it difficult to thoroughly combine the ingredients. I prefer to use an ice cream scoop for my muffins because it hold the right amount of batter and the lever makes it easy to scoop the batter into the muffin cups. You want the cups to be filled almost to the top. The batter doesn’t have to be smoothed over. The muffin cups should be divided as evenly as possible. Any extra batter can be added to cups that don’t look as full as others. Once the muffins are done baking, they should be cooled in the pan on a wire rack for five minutes. Then remove them and let the muffins cool completely on a wire rack. 1. Preheat oven to 375 degrees; grease 12 muffin cups or line with paper baking cups. Zest and juice 2 or 3 medium oranges, measure out juice and zest; set aside. Chop and measure walnuts; set aside. 2. 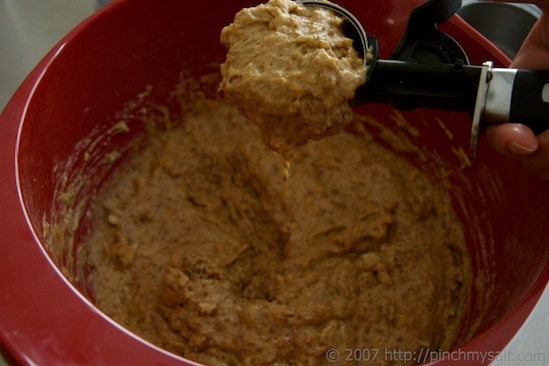 In a large mixing bowl, combine flour, flax seed meal, baking powder, baking soda, salt, and pumpkin pie spice. Using a wire whisk, blend ingredients together very well. This is your dry mixture. Set it aside. 3. In a separate bowl, combine beaten eggs, buttermilk, orange juice and zest, oil, brown sugar, and vanilla. Whisk together well. This is your wet mixture. 4. 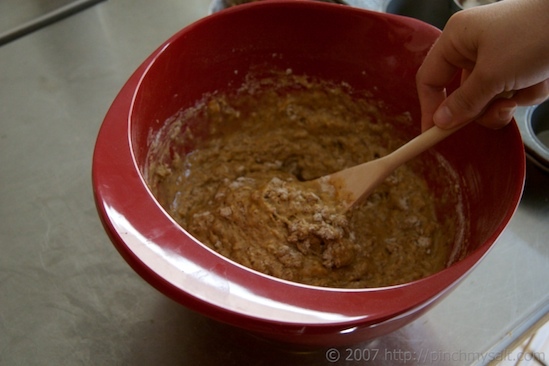 Pour the wet mixture into the dry mixture and stir with a wooden spoon just until all the flour has been incorporated. 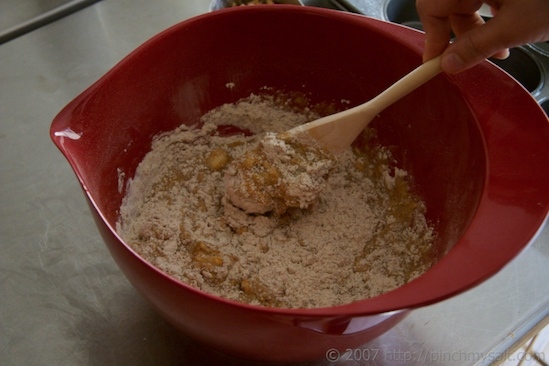 Make sure to scrape up all the flour from the bottom of the bowl as you are mixing. 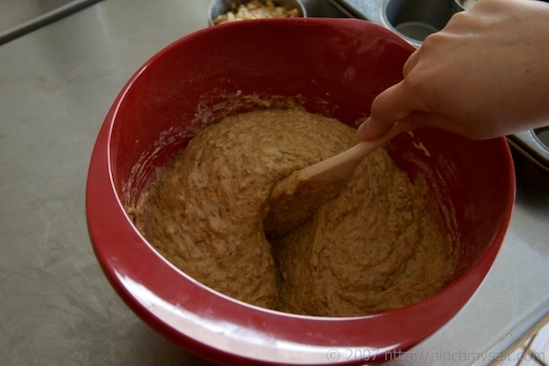 Once you no longer see any pockets of flour remaining, gently fold in the walnuts. 5. 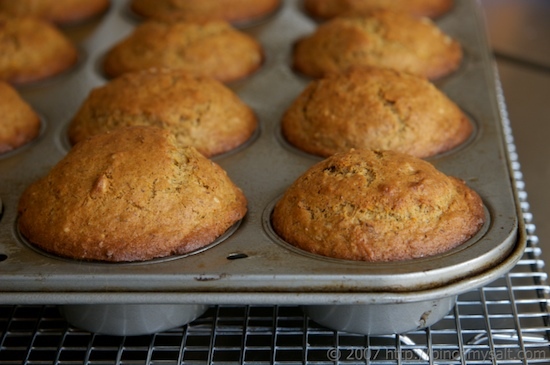 Using a large spoon or an ice cream scoop, fill each muffin cup almost to the top. Divide any remaining batter between the cups so that they are somewhat equal. 6. Put the muffins in a preheated 375 degree oven and bake for 20 minutes. Check to see if they are done by inserting a toothpick into the center of a muffin. If the toothpick comes out clean, they are done. If not, let the muffins bake an additional 2 minutes and check again. When muffins are done, let cool on a wire rack for five minutes then remove muffins from pan and let cool completely on the wire rack. I suggest using King Arthur White Whole Wheat flour if you can find it. For best zesting results, use a microplane grater. I used two oranges to get the correct amount of juice and zest but you may use more or less depending on the type of oranges. If you don't have pumpkin pie spice on hand, you can make your own: 1 t. cinnamon, 1/2 t. ground ginger, 1/4 t. ground nutmeg and 1/4 t. ground cloves. Mix it together then scoop out one heaping teaspoon to use in the recipe. Mandarins, tangerines, or other sweet citrus may be used in place of standard oranges. Melted butter may be used in place of oil if desired. « I’m Back with a Tangerine and Jicama Salad Recipe! I will be in SD Oct 20-23 for a meeting .. maybe we can meet then! Hey! Welcome back! It was so fun to find your site,...I've enjoyed reading through it. It was also fun to to find another blogger in San Diego...I'm your neighbor! Look forward to checking your site out again soon! OH, it's you again! (j/k)Welcome back and don't you leave the kitchen or your PC for that long, K? Nice to see you back! I love white whole wheat flour for things like this. Yummy, I can't wait to make 'em! Hi, I discovered your site not too long ago and I have been waiting to se what you would post next. The muffins look delicious. Thank you for sharing, I love the blog. Welcome back to the kitchen! Aren't those Williams-Sonoma bowls great?! I have the pink ones (of course). 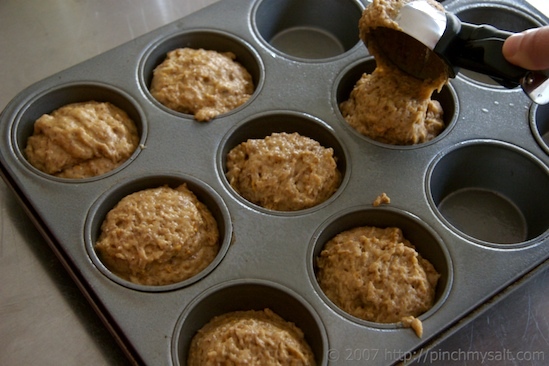 Hey- great instructions and photos....(don't forget to oil the pan)....These muffins are sooooo gooooood !!! Welcome back, Nicole! Again! These muffins look delicious. I see that I'm not the only one with the Wms Sonoma mixing bowls. I have them in white and blue. If I had room, I'd have more. Welcome back, and yes I do think that relocating from Sicily is a perfectly good reason to take a month off! Great sounding recipe. I love that white whole wheat flour! Yay! You're back! I think I'll make these this weekend! Welcome back to not-so-sunny kind-of-rainy San Diego! Nika: Sounds like a plan!Lydia: It's great to see that there are so many bloggers down here in San Diego! I'll be sure to check out your site!Peter: Ok, ok, I promise!Ruby: I know you always say you don't like whole wheat but I think you'd be surprised. Really!Susan: Thanks! I think the white whole wheat works as well as whole wheat pastry flour in quickbreads and such. But it also makes really great yeast bread!Carol: Let me know if you give them a try!Katia: Thanks a lot! I have more recipes coming soon!Emon: Hey! Thanks :-)Erin: I love the bowls! I wanted the green ones but red was the only color they had the day I went to buy them. Luckily, I like red, too!Kathy: Thanks! Try this recipe this weekend, I think they're better than the other recipe I gave you. I decided I like the brown sugar better than the honey or agave nectar. Plus these have more orange zest and have a more pronounced orange flavor.Jennifer: I just bought myself the mixing bowls because I got used to using them at my Aunt's house. They're really nice!Alejandra: Thanks, I'm happy to be discovered! I was just checking out that yummy looking Meyer Lemon Custard ice cream on your site and hope to give it a try soon! My favorite ice cream flavor as a kid was lemon custard from Baskin Robbins!Kalyn: Thanks! The more I use the flour, the more I like it.Mary: Thanks for the enthusiastic welcome :-) Hope you make the muffins!Vicki: Yep, I heard we're supposed to get 3 inches of rain tomorrow night. Yikes! So excited that you're back with such a great recipe! I've been dying to make some whole wheat muffins but I haven't found the recipe I've been looking for...oranges sound perfect! I've been reading your blog for a while but can't remember if I've posted...I'm a big fan of whole grain baking & love your recipes. Welcome back Nicole! I'm glad you're settled and baking again! Tonight I looked for the white whole wheat flour, but couldn't find it. I'll have to keep looking. The muffins look delicious! Welcome back to the US! Isn't it funny how absence (from the kitchen) makes the heart grow fonder (of cooking)? Thanks for the step-by-step on the muffin method. Sarah: Thanks a lot! Once you start baking whole wheat muffins, you'll find that just about any regular muffin recipe can be converted with no problem. But I think spice muffins and banana breads are a really great place to start if you're new to baking with whole wheat. Anali: I'm not sure how it is in your area but I've noticed the flour popping up at more and more stores here over the last year. I'm sure you'll be able to find it soon. 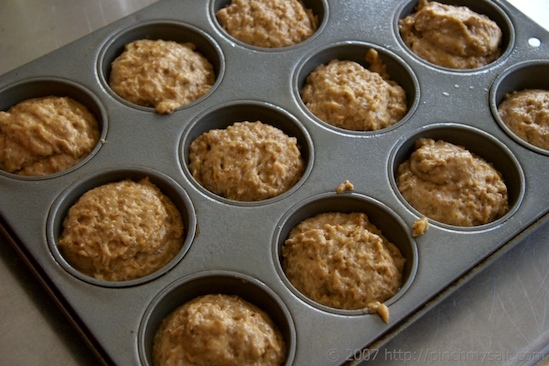 In the meantime, the muffins will still be good with any whole wheat pastry flour or traditional whole wheat flour. If they seem too heavy, you can always substitute part of the whole wheat with some all-purpose flour but I don't really think it's necessary. Lydia: Thanks! It's funny because at first I really missed cooking then I really started to enjoy eating out because I got to try new types of food that weren't available in Sicily. But now I'm definitely ready to be back in the kitchen and will just have to find a balance between cooking at home and trying new restaurants. Sara: Thanks! I am enjoying California and trying not to miss Sicily too much. I really think I'll need to take a trip back to Italy at least once a year though (now I just have to figure out how to pay for that)! Aloha, Welcome back from a San Diego transplant in Maui!! I am thrilled to see you back in action. I just checked in with you site 3 days ago to double check that my subscription was still valid...I believe we were all waiting with baited breath for your return. I am so glad you honored yourself, your passion and your family with a personal holiday...Sharing with 'us' is a privilege not an obligation. Now the recipe, oooh yum!!! I'll be making these for Sunday brunch tomorrow. I get so excited when I have all the pantry ingredients already. For those of you searching for the King Arthur flour or even the flax meal, check out the King Arthur website, request a catalog or such. They are so resourceful for a plethora of amazing ingredients. Your gift of cooking and baking is very inspiring. Much Mahalo for spreading your wealth and passion. Beautiful recipe and pictures... Uhmmmmmmm...... I can smell your muffins here! Thanks for share with us this wonderful recipe! Woohoo...look who's back!! These muffins look D-E-L-I-C-I-O-U-S!! I have to say I wasn't sure about these muffins at first, but then I tried one! YUM! So go ahead and mail me some from your next batch! =-) WELCOME BACK! I missed your blog!!!!! Clumsy: Thank you!VeggieGirl: Thanks for the concern :-) It feels good to be back!Mischelle: You're right, the King Arthur Baker's Catalog is absolutely wonderful! I actually just received a box from them yesterday ;-) Hope you have a great brunch!Annie: Thanks and you're definitely welcome!Dani: Thanks!Corinne: I knew you'd like them! The muffins are in the oven now. Glad you're back. And, with a very appetizing muffin recipe. Bea: Thanks! I'm getting more settled each day :-)Lori: I think it will be great with mandarins! I made one batch with half orange/half tangerine and they turned out great.The Secret Ingredient: Yum! I haven't had any meyer lemons yet this year but I made some Meyer lemon curd last year that was really good!Kathy: Hope you check back in and let us know how they turned out!David: Thanks! Jim said the muffins looked and tasted as good as yours ! success ! I made these muffins today and they are delicious! Also very hearty. I was actually full after eating one (granted, I did make big muffins). Thanks for the great recipe! Glad to see you back! Hope your re-entry hasn't been too bizarre! I'm in the States right now for a few weeks and it's so different than rural France! Not in a bad way, just very night and day. The muffins look delicious so I'll plan on giving them a try when I get back! So glad you're back! I've been checking regularly. I'm off to Naples Italy in just over a month! You've inspired me to start a food/travel/life blog. Just had your sausage and gravy biscuits the other night. I love muffins so will have to try. Glad you're getting re-settled. I made these on Wednesday morning, and they were great! I tried this this weekend and I followed the recipe and instructions to the letter... They're good, but they came out fairly dry. Any suggestions for next time? Catalitical: Sorry your muffins came out a little dry! There are a couple of things you could try. Perhaps they needed to come out of the oven a minute or two sooner so you could try checking them much earlier than my recipe suggested. Or if you think that's not the problem at all, you could try increasing the amount of oil in the recipe. You could try using 1/2 cup instead of 1/3 cup. This will increase the amount of fat and calories, obviously but should result in a moister muffin. Hope this helps! Thanks for the suggestions Nicole. Never fear, I am going to try them again!! Loved these muffins! 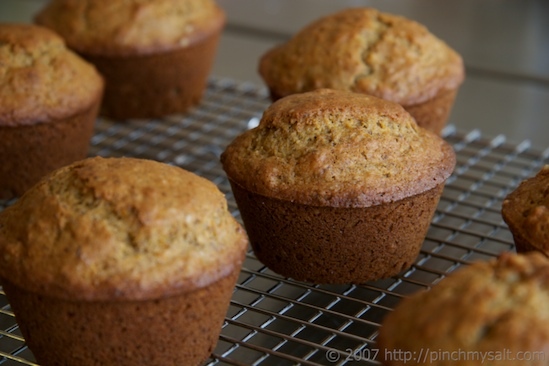 I had some oranges to use up and did a search for whole wheat orange muffins and found these! So good. I converted them to dairy free and egg free easily to meet our families needs. This one is definitely going in the book as a family favorite. Thanks for the recipe; they are wonderful muffins! I just made these today with a couple of modifications (1/2 cup sucanat instead of 3/4 cup brown sugar, 1/2 cup soymilk + 1/2 tbsp vinegar for the buttermilk). Great recipe! Thanks for posting it. =) I'll be trying out your other healthy muffin recipes too. Any substitutes for the flax seed meal? Hi there very nice web site!! Guy .. Excellent .. Superb .. I will bookmark your web site and take the feeds additionally?I'm satisfied to seek out numerous helpful info right here in the submit, we'd like develop more strategies in this regard, thank you for sharing. . . . . .